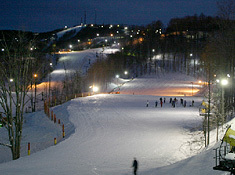 Winterplace Ski Resort is a hugely popular ski resort located just five minutes off of I-77 at Exit 28 in Ghent, West Virginia. Visitors love the fact that Winterplace Ski Resort is the most accessible skiing area in West Virginia, even during heavy snow storms. Winterplace features 27 trails, two terrain parks and WV’s largest snowtubing park, offering 16 lanes of fun, and much more. Quality fun and convenience is something that Winterplace thrives on. They are very popular with groups and families. Visitors always enjoy the full-service Resort Center plus a 10,000-square-foot, mid-mountain facility called The Mountain House with a great mid-mountain food court. “Fun” is a word often used by visitors. 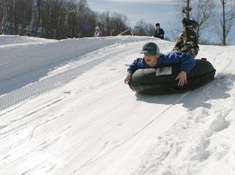 In addition to wonderfully challenging slopes and trails, Winterplace’s Snow Tubing area features 16 lanes! Snowboarders enjoy Winterplace’s Terrain Parks which features many hips, tabletops, rails, gaps and more…Lessons and rentals are available. Winterplace Ski and Snowboard School provides a fun and educational experience for skiing and snowboarding guests in a safe, friendly and relaxed atmosphere. Winterplace guarantees you will learn to ski or snowboard or you can take the class again, for free! Winterplace offers a specially designed teaching area with two Super Carpet lifts, then beginners can move on to chairlifts which offer access to a variety of beginner slopes. The ultimate entry-level program. Includes beginner lift ticket, equipment rental, and 90 minute group lesson. Weekday lessons are $35.95 for both skiers and snowboarders. Friday lessons are $49.95 for both skiers and snowboarders and Weekend and holiday rates are just $75.95 for both skiers and snowboarders. Enjoy the full mountain experience with an all day, full mountain lift ticket, equipment rental, and 90 minute group lesson. Lessons available for all levels, from beginner to expert. Weekday package for skiers is $89.95 and weekend/holiday package for skiers is $99.95. Snowboard package during the week is $99.95 and weekend/holiday package is $119.95. Group Lessons—Group lessons are available for skiers and snowboarders with all abilities. Groups of eight to ten students can take lessons for 90 minutes for only $30. Ultimate learning experience. Classes are 60 minutes and limited to 4 people. Private lessons are available on weekdays and weekends. Private lessons are only $62 and if you’d like to take the lesson with a friend, it is only $32 for each additional person. The Adaptive Program is designed for people with visual, hearing impairment, developmental and cognitive disabilities, amputees, cerebral palsy, spina bifida or traumatic brain injury. The lesson duration is a 2 hour minimum. It is recommended that those in this program take two sessions, one in the morning and one in the afternoon with a break in between. Reservations are suggested for these lessons as a limited amount of equipment and qualified staff is available! Stay and Ski FREE Package!! Call us at 800-607-SNOW to find out how to receive FREE lift tickets when you stay at The Resort at Glade Springs or any of our fine lodging partners. The Resort at Glade Springs offers multiple choices in affordable, first-class lodging with great amenities. After a day on the slopes, relax at The Glade Springs Spa with a massage or sauna. Enjoy fine or casual dining at Glades Grill or the Small Talk Cafe. To take advantage of the Ski FREE! promotion, rooms must be booked through Winterplace Central Reservations or directly with the participating lodging facility. You must present the coupon at the participating lodging facility. Not valid with third-party, on-line reservations (Expedia, Travelocity, etc. ), other discounted offers or group rates. Offer subject to change, availability and certain restrictions may apply. Stay at The Resort at Glade Springs or other fine participating lodging facilities for one night (any Sunday through Thursday night excluding holidays) and SKI FREE! any day Monday through Friday, excluding these holiday periods: December 22 through January 2, 2015; January 17 through 19, 2015; and February 14 through 16, 2015. Offer subject to change and availability and restrictions apply. The Resort at Glade Springs does not participate in this offer. This offer expires March 31, 2015. Southern West Virginia’s premier, full-service, upscale mountain resort includes two championship golf courses, a full-service spa and nautilus fitness center, indoor and outdoor tennis courts, and two great restaurants—Glade’s Grill & Bar and the Small Talk Café. More than 40 activities, including biking, rafting, guided fly-fishing, sporting clays, and an equestrian center may be enjoyed on this private, 4,100-acre estate. A 50 million+ gallon reservoir for snowmaking water supply capable of pumping 7,000 gallons of water per minute is located onsite. Rental equipment featuring new top-of-the-line Rossignol shaped skis, Snowboards with the step-in and strap-in bindings, Demo Center featuring High Performance Equipment from Atomic & Rossignol, Helmets and bibs, Children’s Skis and Boots. Mickey’s Mountain Café. Mountain Mama’s Food Court. Snowdrift Lounge. The MountainHouse – Mid-Mountain Food Court. Free Night Skiing with All Day Lift Ticket. Member of the National Ski Patrol System. Member of the Professional Ski Instructors of America (PSIA). Head To Head Racing available. 6,000+ beds in the Winterplace Area.